Cookie Crust: Preheat oven to 325° F. Mix sugar cookie mix and butter together until well combined. Stir in one egg. 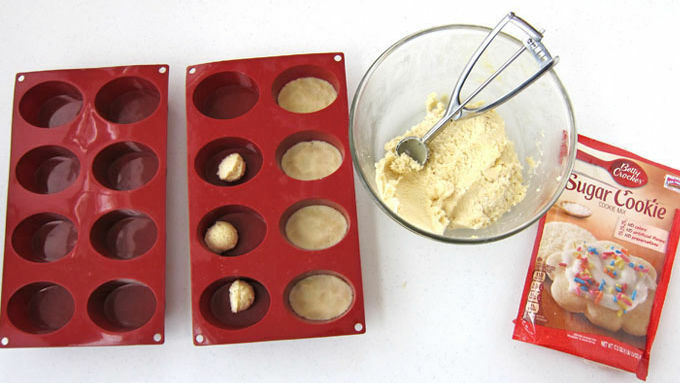 Spoon 2 teaspoons of dough mixture into 2 silicone molds (with 8 oval-shaped cavities each). Press dough mixture into an even layer and bake for 10 minutes. Remove and immediately press down on dough around the puffed edges, flattening it into an even layer. Allow cookie crusts to cool completely. 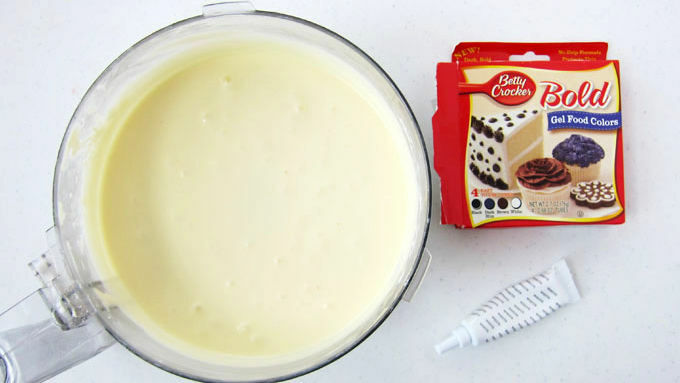 Cheesecake Filling: Place cream cheese blocks in bowl of a food processor (or stand mixer). Pulse until cream cheese is smooth. Add sugar and pulse until combined. Add eggs, whipping cream, and vanilla and pulse until well-blended. If filling is overly yellow, add some Betty Crocker™ Gel Food Color White. Equally divide filling into 6 bowls. Color one bowl purple, another blue, green, yellow, orange and pink using Betty Crocker™ Gel Colors. Spoon about 2 teaspoons of purple filling over each oval-shaped cookie crust. 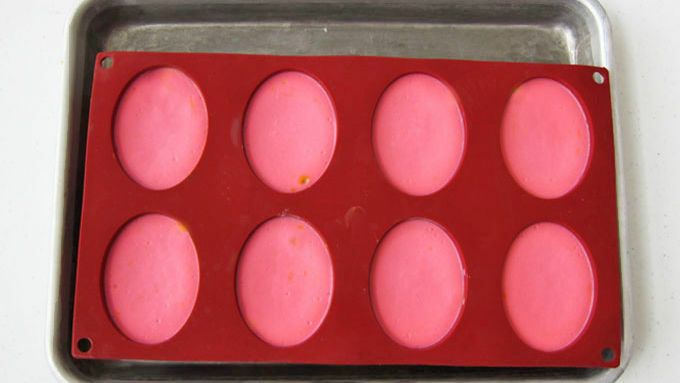 Repeat creating a blue layer, then a green layer, a yellow layer, an orange layer and finally a pink layer, tapping the mold on the counter a few times after adding each color to remove any air bubbles. 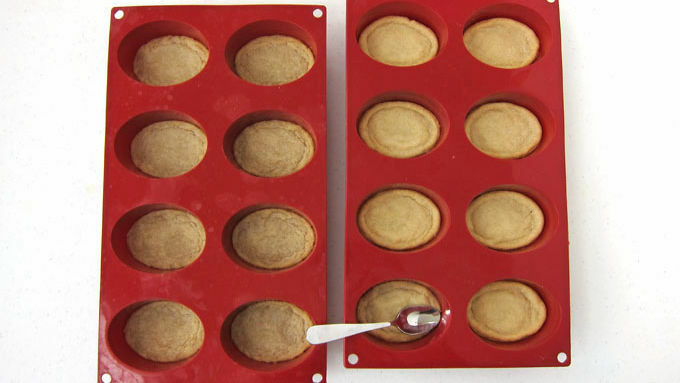 Set molds on 9 x 13-inch baking pans. Place pans in oven and pour about 3/4-inch boiling water into pans, being careful not to splash any onto cheesecakes. Bake for 20 minutes. Remove pans from oven. 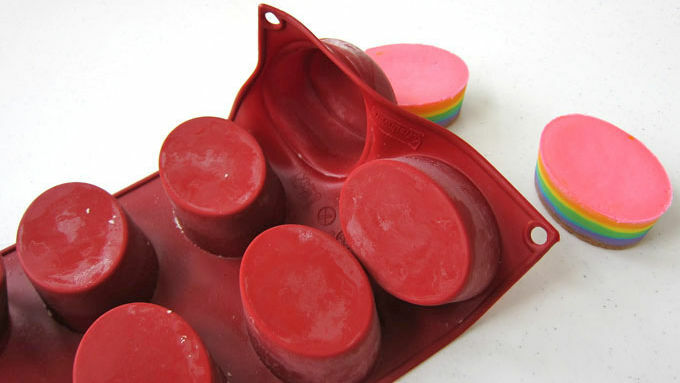 Allow silicone molds to sit in hot water for 15 minutes, then remove and set on counter for 30 minutes. Place in freezer for at least 3 hours, until cheesecakes are frozen solid. Remove and un-mold the cheesecakes. Refrigerate until ready to serve. Before serving, set cheesecakes out at room temperature for 15 minutes to soften. Don't you just love the Easter season? The dreary browns of winter blossom into bright and cheerful colors. 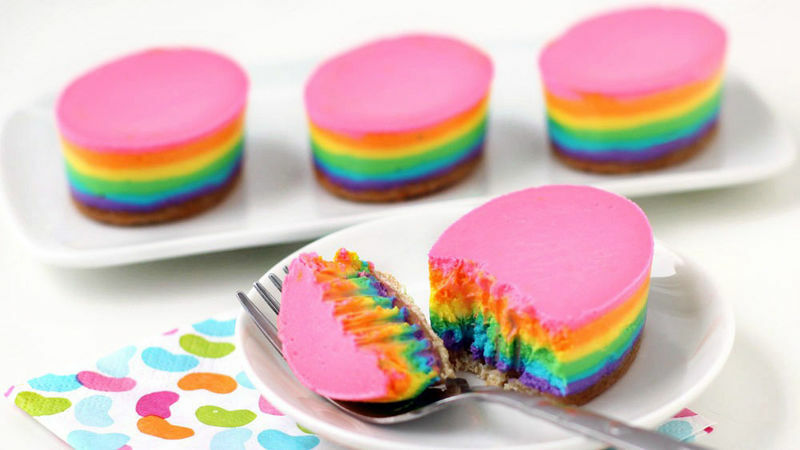 It's the perfect time of year to create a festive rainbow dessert like these cheesecake eggs. It's a holiday tradition to color Easter eggs, so this year after you finish dipping hard boiled eggs into bowls filled with colored dyes, grab some Betty Crocker® Gel Food Colors, whip up a batch of lusciously creamy cheesecake filling, and color away. Fill your bowls with purple, blue, green, yellow, orange and pink cheesecake filling, then layer each color over a crunchy cookie crust to make the prettiest Easter egg dessert you've ever seen. 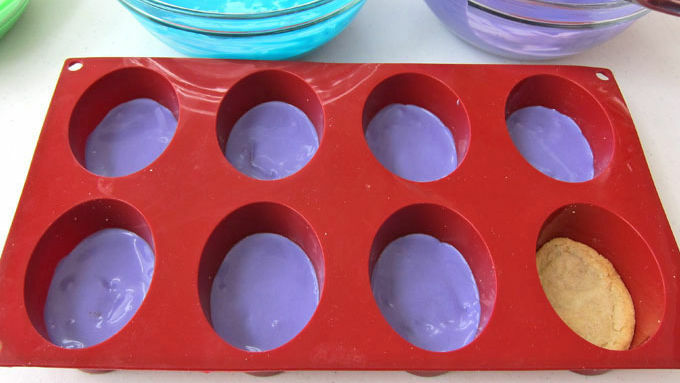 To make these Easter egg-shaped desserts, you'll need two silicone molds with a total of 16 oval cavities. 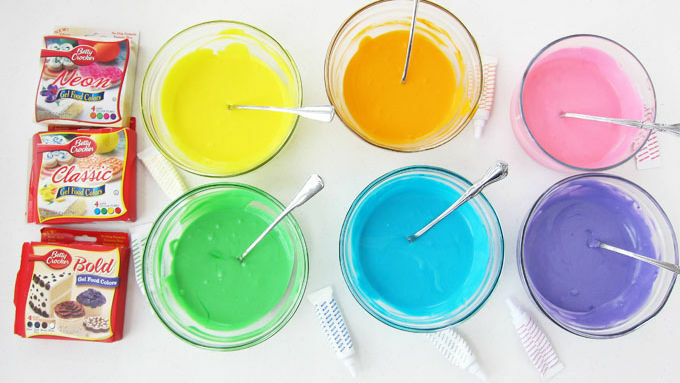 This fun, rainbow dessert is the perfect Easter treat!